The City administration, developer, and community members will continue their dialogue about what should be allowed on the 500-600-700 blocks of Alton Road at one of Miami Beach's gateways. Residents lined up this week at the Commission’s Land Use and Development Committee meeting to give their opinions on which proposals they liked best. Developer Russell Galbut wants to build a tall tower on the 500 block, a low-rise building on one side of the 600 block that may include residential units along with retail, and a large public park on the remainder. Galbut currently has approval to build a series of low-rise buildings with 510 residential units and 75,000 sq ft of retail and very little green space. He has proffered three new plans with towers in varying heights of 38, 42, and 50 stories. The size of the building on the 600 block changes (it gets smaller) as does the size of the park (it gets larger) as the towers get taller. Galbut is asking the Commission to “vacate 6th Street” – which would not close the street but allow him to aggregate the allowable FAR (or density) onto the 500 block to build a tall tower. Currently, the height limit on the block is 7 stories. The Gateway Community Alliance has suggested its own plan for the site which includes a 28-story tower and what they say is more park space and more permeable green space. They object to Galbut’s plan to count a grassy area over top of an underground garage as true green space. The nearly 2.5 hour discussion was not only a debate about what should be built on the site but which organizations speak for residents. Galbut gave his presentation first in which he noted that he has had 73 meetings with the direct neighbors, the residents of the Floridian and the Bentley Bay Condominiums, who both support his plans. In working with the neighbors, he said his goal was to “significantly reduce density and intensity” from the currently approved project (below). Showing a map of green space in South Beach, Galbut said, “You will see many parks South of Fifth Street but you won’t see any on West Avenue.” South Pointe Park, he noted, is 1,700 linear feet. The park he’s proposing, “has the capacity to be 1100 feet,” he said. Whichever height option is chosen, he said, “The tower will be in scope and in size with all of the other towers surrounding it. 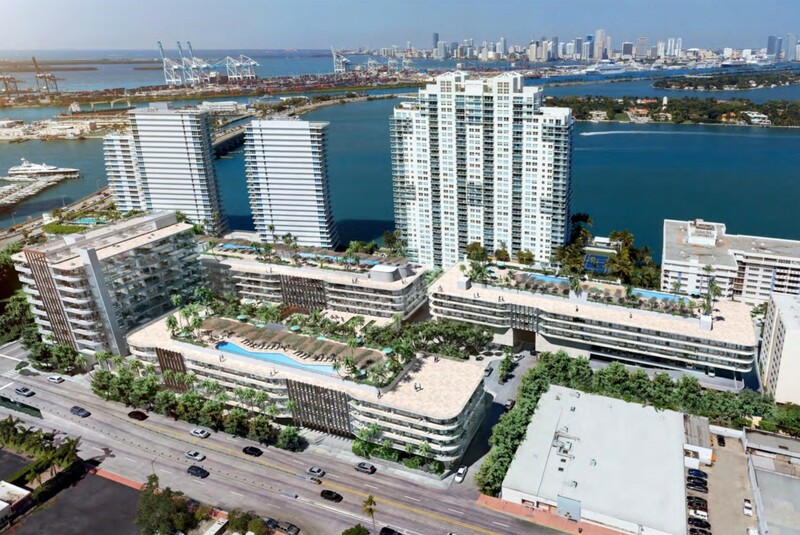 It will neither be the highest nor the largest floor plate in South Beach.” And, he added, “We are a whopping 87% permeable surface and that is true resiliency.” The rendering at the top of this article depicts option two in Galbut's proposals with a 42-story tower. 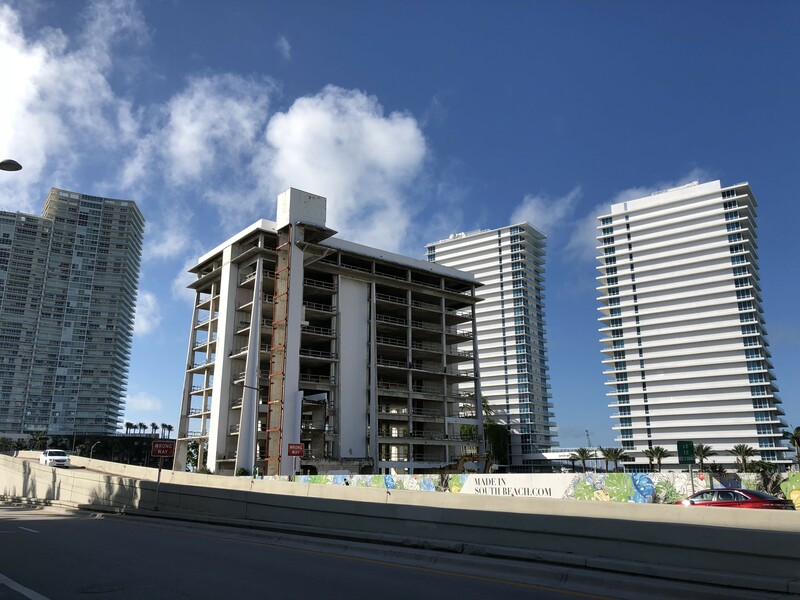 “We’re concerned that over development at this site going outside established zoning and FAR could harm Miami Beach in the future.” FAR is Floor Area Ratio which is used to measure the density of a building. 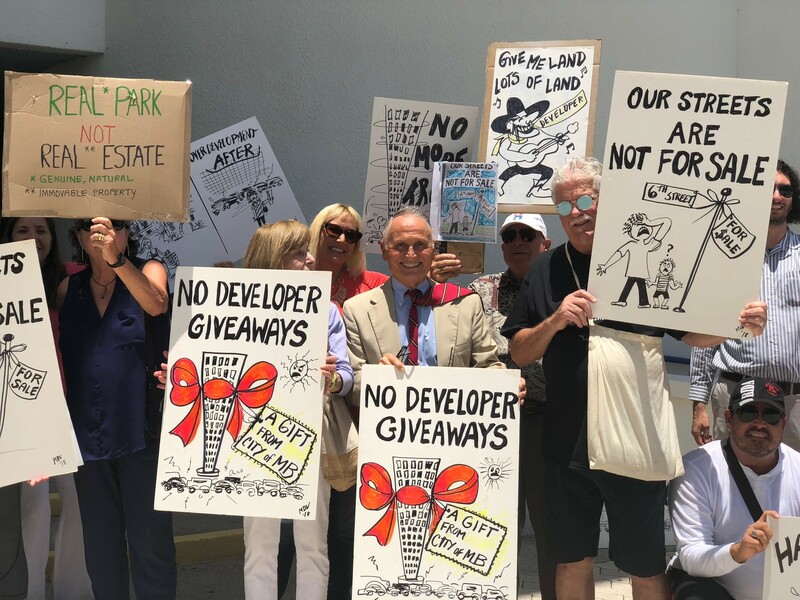 He said several neighborhood associations passed resolutions against the developer’s proposals including Miami Beach United, West Avenue Neighborhood Association (WAVNA), South of Fifth Neighborhood Association (SOFNA), Sunset Harbour Neighborhood Association, and Flamingo Park Neighborhood Assocation. The concern, Honker said, was that this type of development – vacating a city street and aggregating FAR – “may spread to other parts of the community. This could allow skyscrapers to be created in any neighborhood along with what’s happening on that site. If zoning can be changed there, it can be changed elsewhere.” Any change would require a 6/7th vote of the Commission, a high hurdle. Then he threw out a new idea – utilize the proposed General Obligation (G.O.) Bond offering to purchase the 600 block “which creates an opportunity for a 100% permeable public park on 6th Street, eliminates the South Shore Hospital, and gets rid of all this community bickering and fighting over lot aggregation” and number of stories. The speakers then lined up, each given two minutes to express their viewpoints. What followed was consensus on many items with the main sticking point continuing to be the size of the tower. But another disagreement became evident very quickly… who can claim to speak for the residents of the area? He concluded, “We are concerned about the potential for any plan that would require vacating 6th Street” adding that they would “support the G.O. Bond idea” to have the City purchase the 600 block. “That’s a terrific compromise,” he said. He cited the recent ULI visit and summary of recommendations for the City’s resiliency efforts which “clearly stated that in order to deal with our future issues,” more green space and vertical solutions would be necessary. “If you keep pushing this issue ‘we don’t want towers, we don’t like towers,’ you’re living in the past. You’re not dealing with the future of where this city needs to go in order to solve its problems,” Cacchione said. Cacchione also noted that at a recent public meeting, Planning Director Tom Mooney said allowing this project to proceed with a taller tower would not set a precedent as each project is looked at separately, a statement that Mooney confirmed. The old South Shore Hospital building on the 600 block of Alton Road. He listed the areas of agreement: Eliminate the old South Shore Hospital building on the 600 block (above), an expanded park, and less intense development of the 600 block. “It may be true that there is no legal precedent established if you interpret the City’s charter and zoning on a case by case basis, but if the City Commission chooses to do this, it is setting a public policy precedent. It means that you’re open to replicate this on a case basis so I’m concerned about that.” He also said it was important for City staff to analyze the developer’s proposed plans and consult experts as necessary and feasible to help the community understand them better. He believes that “a 28 story or even higher [tower] if it’s feasible for the developer on the 500 block” could create more ground level public park space rather than the proposed green space on top of a parking deck that is only available to residents. By his estimates, that option could provide one acre of public park space on the 500 block along with 3 acres on the 600 block which would be acquired by the City to create a 4-acre park. Prior to the meeting, Del Vecchio led a rally outside City Hall to show support for the Alliance and its proposal (photo below). Cindy Esquivel also took issue with the neighborhood association representation. She told the Commissioners that she is a SOFNA Committee member who came out to speak as an individual. “The recent SOFNA Board letter that you got was provided by the Board. SOFNA members were not given a chance to give input," no meeting to discuss the association’s position and no survey of residents. “I found it alarming,” she said. Our Board “advised our membership that they would provide their recommendation after they reviewed the developer presentation. This, of course, did not happen. The letter of recommendation with no general member input was sent instead. And that I found very alarming. Though several Board members from SOFNA have opinions on that, all of which I respect, this organization has not opined. I ask that the Commission be mindful of SOFNA’s current Board action as you weigh their agreements on this very important project to all of us as they are not currently, in my opinion, coming from our SOFNA committee as a whole." Wanda Mouzon from Flamingo Park said while she, too, is “tired of the eyesore” that is the old South Shore Hospital building, she has concerns about the project, specifically with the traffic. “90% of the time,” she said, "traffic issues are related to the street design." She urged the developer to “address the street, create a walkable environment. There’s nothing that kills walkability like a tower in a park.” Mouzon noted, “The South of Fifth towers observe the street well. It’s really key, even if the height is granted and the park is built, that we rethink the way the building addresses the street.” The way to address the traffic concerns is to address walkability, she said. Jack Johnson, also a Flamingo Park resident, said, “Another speaker said that the Flamingo Park Neighborhood Association should not have a voice in this matter. I believe that any proposed development of this magnitude at a major entrance to the City is a citywide concern and not just a concern of the people who happen to live across the street. It, in part, impacts the Flamingo Park Neighborhood Association because we do, in fact, live right across the other street. We just happen to be on the other side of a different street from the proposed development,” he said referring to the Alton Road side of the project. Valerie Crawford, a Mirador 1000 resident said, “It’s amazing to me that we’re talking about this project as if the land is public land. It’s private land that a developer has a right to do, a developer that owns in this community, lives in this community, has family that is entrenched in this community, and that we’re treating the developer as if he’s somebody that’s outside the community that doesn’t have a vested interest, that the land is public and that we have a right to decide what’s done on that land. I’m finding that mystifying,” she said. Finally, it was time for the Commissioners to weigh in. Góngora said he was not ready to send the item back to the full Commission with a recommendation. Instead, he said, he wanted the administration to spend more time with the developer and community. “Pursue all options,” he said, “including the potential purchase of the parcels and come back with a proposal next month” for the Land Use Committee to consider further. Commissioner Kristen Rosen Gonzalez complemented the formation of the Gateway Alliance and NOFNA, and both for advocating on behalf of the community. However, like Góngora and Rosen Gonzalez, he said he needed “more facts and data” including estimates on the value of the 600 block as well as the value of a tower at various heights to the developer to understand the incentive for Galbut. In the meantime, he encouraged the administration to have a dialogue with the developer to see if a deal could be made for the 600 block. The Committee then voted to direct the administration to negotiate with the developer to explore all options and to work with the community to reach an agreement reporting back to them next month.